Hi! 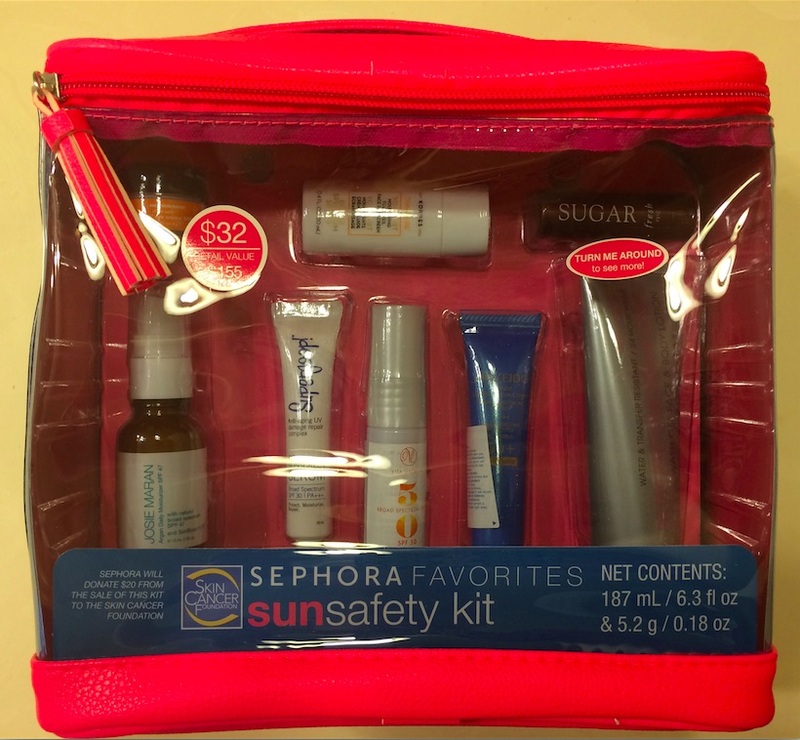 I was able to get my hands on this years fast selling Sun Safety Kit from Sephora…and I am going to review it for you! The photo above is the front of the bag and contains the first 8 products. The other 8 are in the back. I will show and review all 16 products included in the pink/clear reusable tassel zippered bag. 1. Supergoop! City Sunscreen Serum SPF 30: 10ml/0.4 oz This Supergoop! sunscreen is described as an Anti-aging UV damage repair complex with moisturizing properties. My experience/thoughts: The sunscreen scent is very light as is the product. It absorbed into my skin well and quickly. When dry I did not feel as though I was wearing anything…which is a good thing, especially for wearing under makeup or other product. 2. FRESH Sugar Lip Treatment SPF 15: 0.08 oz. Who doesn’t love Fresh lip treatments? I know I have at least 3 around at all times. I must say, however, I have never owned the original untinted version that is included in this set. The formula is exactly the same as the tinted versions. ie: smooth texture, non-sticky or waxy, feels nice on the lips. The scent/flavor is light and a bit sugary and lemony. It’s one of my must have products for keeping my lips soft and smooth. 3. Korres Yoghurt Nourishing Fluid Veil Face Sunscreen: 10ml/0.4 oz. This sunscreen had a nice slight beachy coconut scent, not overpowering at all, just enough to give you that ‘yay, it’s summer nostalgia feeling’ Its light, thin and absorbs quickly without a trace. I really liked it! 4. 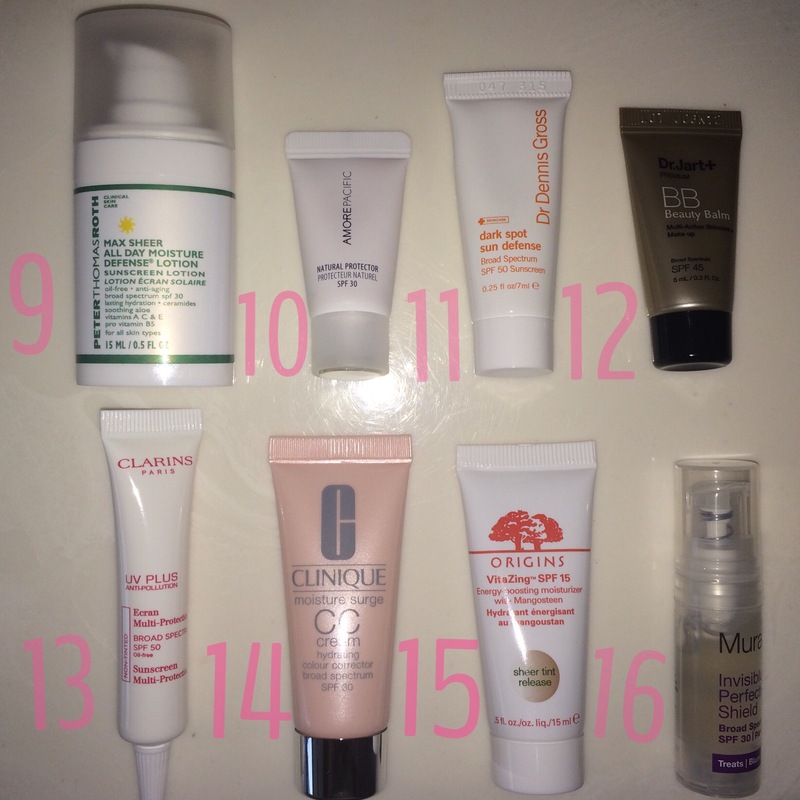 OLEHENRIKSEN all skin types Total Truth Eye Cream: 0.1 oz. This is a thicker, rich and emollient eye cream. 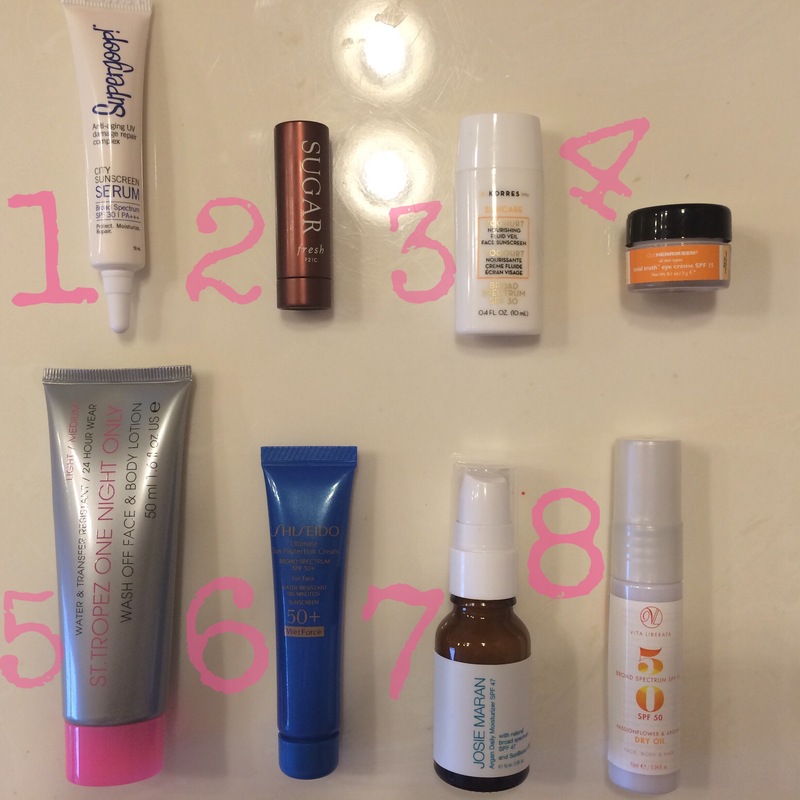 I generally use a de-puffer by day and night time eye creams that do not contain a sunscreen. I was a bit worried that the sunscreen might irritate my very sensitive eyes. It absorbed well though and did not bother my eyes so i plan to use the sample until it is gone as my day eye cream and then determine how relevant it is to me. 5. ST. Tropez One Night Only Wash off Face and Body Lotion in Light/Medium -24 Hour wear Water and Transfer Resistant: 1.6 oz. This temporary tan, wash off tinted lotion has a light fresh tint (a tad rose) and goes on easily. While it seemed to stay put through regular wear when I ran my arm under the faucet (turned on lightly) I did notice it affected the color on my arm SO I would not recommend using it if you are going to be splashed or partially wet… The color describes it as light to medium. I would say it’s light, for a tanner. The color is good; light brown and not orange, but it’s definitely a light tan. It barely darkens my lightly tanned light/medium light skin tone. I think it would be perfect for a fair to light skinned person. 6. Shiseido Ultimate Sun Protection Cream SPF 50+ for face -Water Resistant for 80 minutes. 0.6 oz. This sunscreen was a bit thicker than the the first 2 but still absorbed well with a bit more effort. The scent is light and quite nice, a bit ‘green’ botanical. 7. Josie Maran Argan Daily Moisturizer Natural SPF 47 and Sun Boost ATB* 0.5 oz. I cant say what the Sun boost is or is supposed to do b/c there is no further info regarding it. The product itself is similar in thickness to the Shiseido and seemed like it might be a bit greasy at first but did end up absorbing well in the long run and definitely felt moisturizing as it claims to be. I generally like JM Argan products and find they benefit my skin well. The scent was barely detectible. 8. Vita Liberata Passion Flower and Argan Dry Oil SPF 50 – for face, body and hair: .34 oz The oil came out a bit thicker than I expected for being a spray dry oil but did absorb well. I think I will use this in place of my other argan oils in my hair until it is gone and see how I like it. I’m not much for oils on my face and body for day time use. 9. PETER THOMAS ROTH Max Sheer All Day Moisture Defense Lotion -oil free and anti aging spf 30 0.5 oz This is a thicker well absorbing moisturizing sunscreen with a light typical sunscreen scent -contains ceramides, aloe, vitamins A,C and E and pro vitamin B5. Good for dry skin types. 10. AmorePacific Natural Protector SPF 30 0.1 oz This is a cute little sample and has a little mirror on top of the cap. I bet the full size packaging is quite nice. It is a medium consistency and absorbs well and very quickly, what i do not like is that the scent (while not terribly strong) is similar to a self tanner ‘after tan’ odor. 11. Dr. Dennis Gross dark spot defense SPF 50 0.25 oz Medium consistency, quick drying, almost matte, I like that. Scent is extremely light, nearly undetectable. 12. Dr.Jart+ premium BB Beauty Balm Multi-Action Skincare +makeup SPF45 0.2oz This is a nice BB cream with a light neutral tint and light coverage. Absorbs well with a nice finish. Suitable for light to medium skin tones. Little to no detectable scent. 13. Clarins Paris UV plus Anti Pollution-untinted Ecran Multi-Protection SPF 50 0.3 oz A sunscreen for the city dweller 🙂 light and easily absorbed with a light sunscreen and somewhat citrusy scent. Smoothed my skin. 14. Clinique moisture surge CC cream -hydrating colour corrector in light/medium SPF 30 .5oz Neutral shade a bit darker than the Dr.Jart and a bit more coverage. Odor is light. It takes a bit more effort to blend. It absorbs pretty well and did not feel heavy or greasy. Good product if you are not willing to go totally bare at the pool or beach. OK. I feel as though I left the best (my favorite) 2 products for last. I will definitely be purchasing both of these! 15. Origins VitaZing Energy-boosting moisturizer with Mangosteen and ‘sheer tint release’ SPF 15 .5oz This product is more along the lines of what I would use for an everyday coverage plus sun protection. It’s light with some coverage and the tint is perfect! It has a very light scent that is nice. When dispensed it is white with tiny grayish speckles in it. If you have tried L’oreal Magic Skin Beautifier BB cream, it is similar to that, with a bit more of a moisturizing property without being heavy at all. It starts out white on your skin and quickly changes and adjusts to your skin tone. 16. Murad Invisiblur Perfecting Shield SPF 30 PA+++ Treats.Blurs.Protects. 0.17 oz Love. This. Clear, super light and airy. Very light, fresh scent. Gives your skin a smooth airbrushed look. Use as a primer alone or under your makeup. I hope you find these reviews helpful! Stay tuned for more reviews in beauty/lifestyle!